My kit has a copyright date of 1975 and I paid $1.75 for it back then. This model represents an early Typhoon I.B. which had a framed cockpit canopy and three bladed airscrew whereas later versions had bubble-type canopies and four bladed airscrews. The early Typhoons had some successes against low lever tip-an-run raids by F.W. 190's, but they gained their greatest fame by their train and tank busting activities. Engine: 2,200 h.p. Napier Sabre II A. Maximum speed: 412 m.p.h. at 19,000 ft.
Armament: four 20 mm cannon and provision for two 1,000 lb. bombs or eight 60 lb. rocket projectiles. Frog was a model company based in the UK that went out of business. Novo in Russia acquired their molds and later went out of business themselves. This kit came in a tray and lid type box that has the lid hinged to the tray. It was shrink-wrapped. The box art shows a Typhoon taking off from an airfield and just folding its gear. 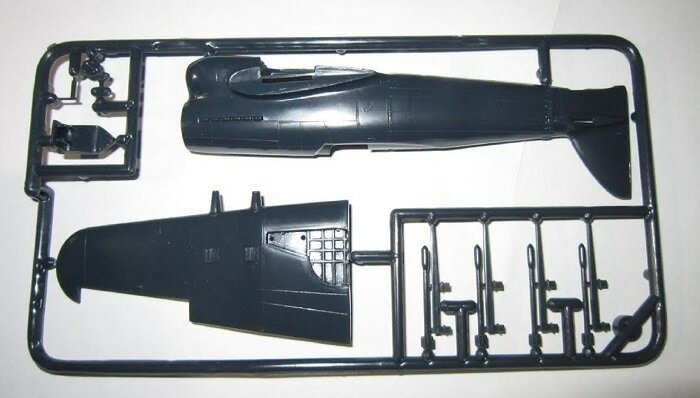 The ends and one side panel of the lid have 5 color box arts of other aircraft kits that Frog manufactured: a Sea Venom EA.W.Mk. 21/53 Strike fighter, a Swordfish Mk.I Torpedo Plane, a Messerschmitt Me.262A Jet Fighter, a Wessex Anti-submarine helicopter and a Mirage IIIE/0 Interceptor Ground Attack aircraft. No kit numbers are shown for these 5 and I assume that they are all to 1/72nd scale. One side panel of the tray has a list of features of the kit in 8 languages, including English. Each language labeled with a color illustration of the roundel or marking of the countries that speak those languages. 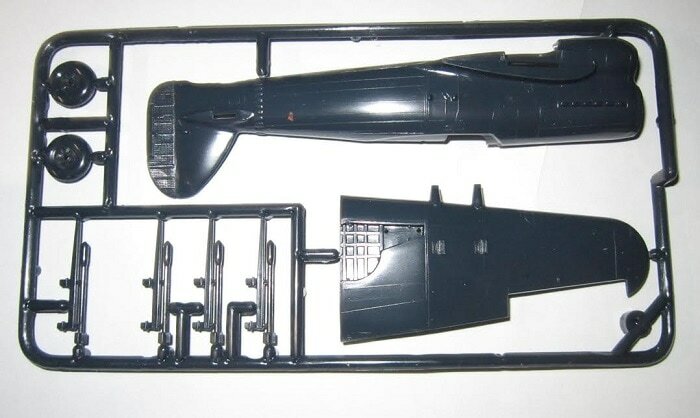 Features are: 33 parts, guns and rockets, undercarraige up or down, decal sheet with alternate markings for versions shown on the box bottom. wingspan 7". 1. A Typhoon in a wave pattern of matt dark green and matt ocean grey over medium sea grey undercarraige. It has black and white D-Day Invasion stripes under the wings, a sky fuselage band with a black serial no. R7855 over the band and the fuselage code in sky of PR (roundel) D. There is a red shield with an undecernable white character on it under the windscreen on the side. The aircraft was with No. 609 Sgn., Royal Air Force, Manston, Kent, 1943. Flown by F/Off. R.A.F. Lallement "A" Flight. 2. The box art scheme. It is in the same color scheme as the one above. It carries a sky fuselage code of US (roundel) C and has a black serial no. DN317 over the fuselage band. The aircraft was with No. 56 Sqn., Royal Air Force, Matlaske, 1943. 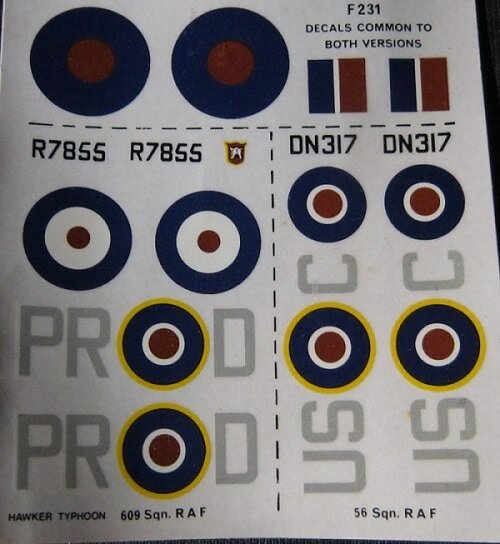 ​Kit was made in England by Rovex Models and Hobbies. 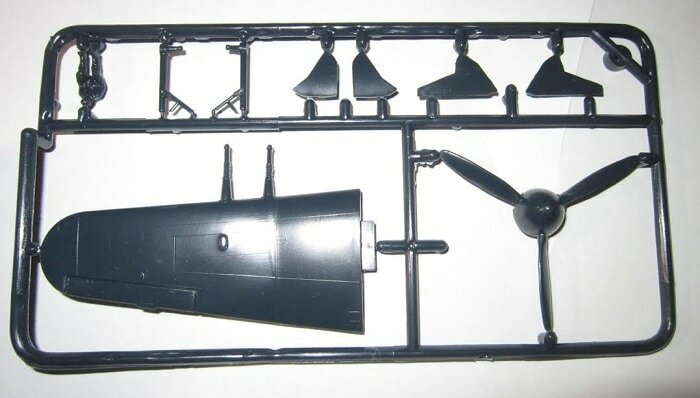 This kit contains 4 dark charcoal grey trees of parts, a clear canopy part, the decal sheet and the instructions. The instructions consist of a single sheet printed on both sides in 16 1/2" x 11 1/2" page format, folded several times to fit the box. The face side of the sheet has 10 TOP MODEL TIPS across the top of it, with illustratons of those tips. Next is a one-paragraph history of the Typhoon in 8 languages, including English. Below these is international assembly symbol explanations and the fist 4 assembly steps. The reverse side of the sheet continues with a grand total of 10 assembly steps. Step 10 has an A and a B part for either wheels up or down construction. Part trees are not cello bagged or illustrated in the instructions. Trees are not alphabetized. There are no part number tabs next to the parts on the trees. Bad move Frog. 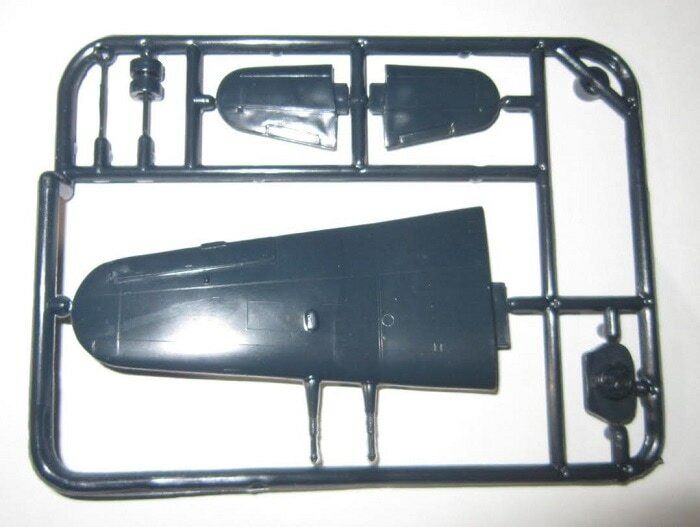 ​The clear part is the cockpit canopy. The decal sheet has a tissue to protect its face from scratching. However, it was floating around loose and not protecting a darn thing. So, I stapled it to the decal sheet. This is a neat salty looking British WWII fighter. I bought my kit back in the 70's for under two bucks at a local hobby shop that went out of business.